I wanted update you about Sidney. First I am no professional dog trainer but working with Sid is a breeze. She has done everything I have asked and more. It is amazing how fast she learns things. I have never crate trained before and wasn’t sure how it would go. After the first week after I took her outside in the morning she would go straight to the crate without being told and has done that every morning since. The crate also made house breaking fast and easy. She’s great with the girls they play for hours. She loves to catch balls and Frisbees. Last week I took her squirrel hunting and in the first hour she found three without any training. I wasn’t expecting her to do anything. I just took her along for the exercise. 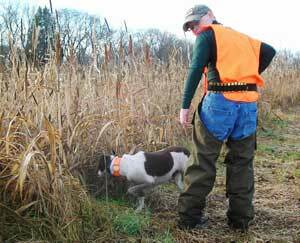 She learned just by going with me earlier in the season. Needless to say I couldn’t be happier with her and glad we went with you as a breeder. Here are some pictures of Sid from early fall from our walks in the woods and her playing in the snow for the first time. Thanks for a great dog. Talk to you again. I hope you had a great weekend!! First and foremost I want to thank you both for the blessing that you brought into our life. Our boy Huck has been everything and more that we hoped for!!! 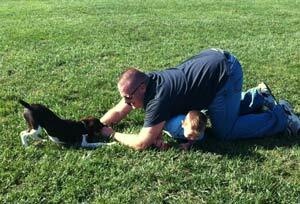 He picked up the fundamentals in what seemed to be overnight and his temperament is beyond positive. This is our 1st puppy, and he has been the perfect addition from the day we picked him up! His favorite pastime is playing grab the feathers with me and his pheasant wing;) once again thank you again as we are both very content with Huck and might be thinking about another playmate for him in the future!! PS: Everyone keeps asking for your information after they meet Huck, and I think that’s the greatest compliment of all;)!! We just wanted to give you an update on Hunter. He is growing like crazy and is already weighing around 75 pounds. If he grows into his feet we’ll have a really big boy on our hands! Everybody that meets him comments on what a great temperament he has and how laid back he is for only being 7 months old. We have been working with him quite a bit and overall he has been a really quick learner, learning many of the commands in only a couple sessions. Although I love winter and snow, I can’t wait for the snow to come off so we can get out shed antler hunting. His nose is phenomenal and our training sessions have me very excited about what he will be capable of finding this spring. All in all, Hunter has been a joy to have around and that speaks volumes to the quality dog you breed at Rock Steady Kennel and all the time you spend with the puppies before they leave for their new homes. Thanks again! My son, Blaze, encouraged me to email and share our first week with Sissy with you. She was very reserved when we first brought her home, and voluntarily spent most of the first night in her crate in our kitchen. However, since then, she has come out of her shell. She has gone many places with us, including school, our family run store, walks through the woods, and to her new grandparents’ homes. She is quickly learning the rules of our house and has learned sit, down, roll over, shake, sit pretty, and has walked on a leash very well. We still have some work to do with come, on our terms not hers. I will send some pictures soon, as she is growing quickly. Thanks so much for allowing us to make her a part of our family. Just wanted to tell you that we are so very impressed with the little girl we purchased from you. Sophie is the most beautiful, well-mannered, gentle, sweet dog you could ask for. We get stopped everywhere we go and asked where we got such a great beauty, and we always send them your way! 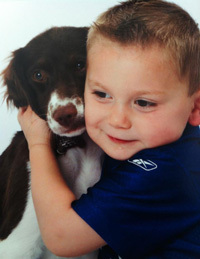 She is best friends with our little boy Ben, as you can see from the pictures below. We are just thrilled every day that we’ve had her. She’s such a sweet, smart, kind, loving, intelligent little gem. We will definitely be returning in a couple years when we are ready to expand our family with another Rock Steady Brittany. I hope you enjoy the pictures of our little Sophie! Just wanted to let you know how Cecelia is doing. The first few nights were a little rough, she cried unless she was in someones arms. So needless to say she’s getting very spoiled. She loves to sleep on the couch, next to me or on top of whoever is available. She is teething and loves to bite everything, so she has a ton of toys. She has made friends with my older dog, Bambi, who was a great mom and has adopted her. My cocker spaniel on the other hand is a little annoyed that she’s here, it will just take some time for him to adjust. She loves to watch me cook, like the other dogs, and tries to stick her face into Bambi’s dish every time my back is turned. She loves to play, she likes to chase feet and we attached some turkey feathers to a string and stick and she likes to catch them. We will keep you updated. Thank you so much for taking such good care of her, she is so friendly and loveable and that is because of you. You did a wonderful job! Hi Sue & Mark………Just an update on Gromit. He’s up to 36 pounds and fit as a fiddle. He’s a nice dog to work with. He’s tough but not stubborn. He’s on the e-collar but without issue. He even comes running when he hears me turn it on. He knows he’s going for a run. His basic training has gone well and his response is quick. He’s done well with the gun and works fairly close. Henry goes with us much of the time and that has set the pace for Gromit as Henry’s a close working dog. Gromit is also very much the water dog. 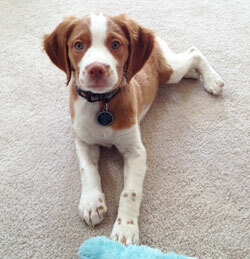 All things considered, this little Brittany is a trainers dream. He’s going to make a fine gun dog. Thanks to you for doing such a nice job with your dogs and all the best in the years to come. 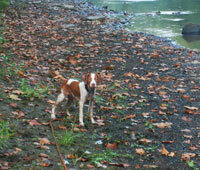 I have attached a few photos of Indy I shot during 2 recent hunting trips. He’s 3.5 years old now and doing very well. One of the photos on point is with my 13 year old son. 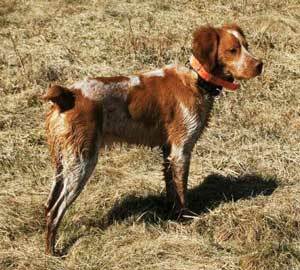 Indy went 24 for 24 working alone at a hunting preserve on the eastern shore of MD. He had a mixed bag of pheasant and quail. 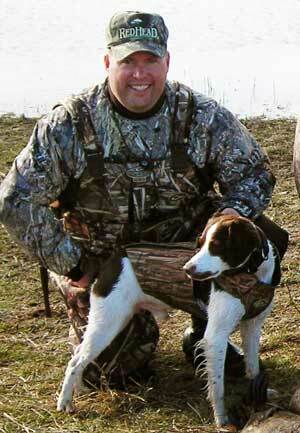 One of the other photos is of a goose hunting trip also on the eastern shore of MD. He has been goose hunting with me about 3 times. Very well behaved in both under and above ground blinds where he would sit for several hours at a time. His favorite part was sticking his head out of the blind and giving you a heads up when geese were flying nearby. Photos a little fuzzy but you can see how intense he was. Although he is still only about 50% on his retrieving skills, he tried his best dragging a couple of geese back to the blind. Unfortunately they were almost as big as he was and he needed a little help from a yellow lab friend! He did find and point a wounded goose who, after being hit several times, still flew over a quarter mile away. Indy found him, pointed him, and stayed on point until I got there. My buddies in the blind were more then impressed. We are working daily on the retreive. Hopefully we’ll have that mastered soon enough. Thanks again for a great family and hunting companion! 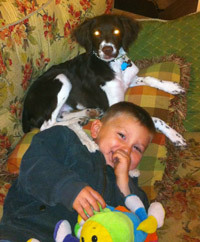 We wanted to send some pictures and give you an update on Kenai at a year old. He is doing great in every way. He has a great disposition, he is smart, he is learning so much all the time. 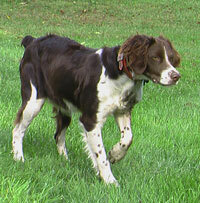 He is a great pet, very affectionate and gets along great with our older Brittany and with our cats. He’s a real people dog, he wants to just be with us all the time. He’s full of energy & mischief, this morning he flushed a wild turkey on his morning walk. We get many compliments on what a handsome boy he is. These pictures were taken recently in Otis MA while visiting friends who were camping there. As hunting season approaches, we will be working more with him on his hunting skills and will keep you updated on his progress. All in all, he’s a great addition to our family & we couldn’t be happier with him. 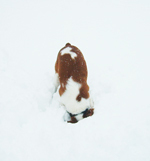 We check your website frequently to see the new litters. We can see what a very busy summer you are having with all the litters born and on the way! We will continue to keep you posted. Thanks again for everything. Kenai is a terrific dog. Mark and Sue Shoff have been wonderful in the purchase and the upbringing of our Brittany we purchased from them 2 years ago. The Shoffs are informative, low key and just plain nice. Our Brittany Jett comes to our Dental office everyday. He is friendly, joyous, a good friend and sometimes he thinks he is a guard dog. 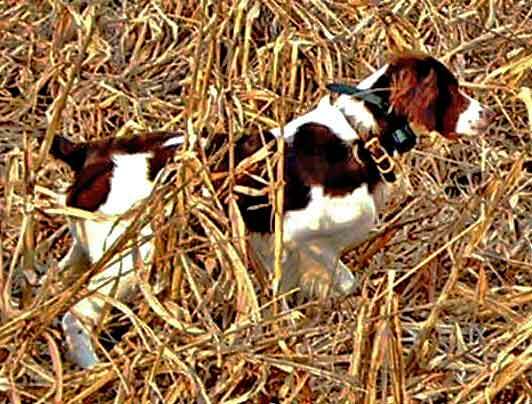 In the field, Jett is a shut down grouse dog. This year we have over 17 walk in points over THE MAN!!!!! 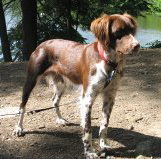 Joanne my wife and I never had a Brittany. These dogs will change your life. They are a bit high maintenance. They require exercise everyday and attention, but the breed repays you with unconditional love, a great hobby for the outdoors. Rock Steady Kennel in our opinion breeds great dogs, they care about who and where their dogs go. Since we bought Jett my in-laws purchased a Lab, and true to form the dog has been outstanding. 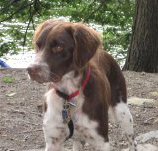 Although Jett is smarter.. Again you can’t go wrong with a Rock Steady Dog. I wanted to let you both know how Sammy is doing. He is a wonderful hunter and a great house pet. 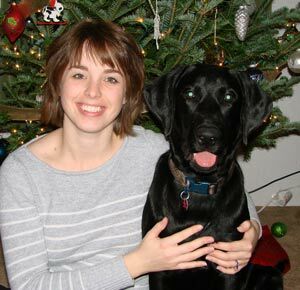 We foster dogs for a non profit group and we have experienced many different types and personalities of dogs. Sammy has a wonderful tempermant and drive to hunt. The other day my husband took Sammy out hunting. He came across another hunter with two Brittnays, both about five years old. This hunter was so impressed by Sammy and the way he hunted he asked my husband to trade him dogs. This hunter was amazed how well trained Sammy was and all the energy he had. Sammy is 11 years old but had more drive to hunt than a five year old dog. I can honestly say his nature and great health are a direct result of your style and kennel. 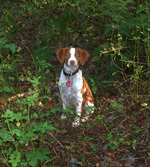 You have a knack for making a loving pet, an avid hunter and a healthy dog. Thank you for raising Sammy and allowing us to be his new family! I cant tell you how much I love my two girls! Raising two at one time was challenging but I survived the first year! I cant believe they are two now! Chloe and Sophie are so different but each a joy! I was thinking about getting a larger breed for protection as my older dogs are not long for this world, but Sophie wont let any of my other animals get near me….she is so cute, she manages to push everyone one away! She is Sooo sweet…. Now Chloe is the boss….she keeps a look out for any strange birds, chipmunks and any other small animal that comes on the farm!….She is more of the “wired for sound”! They have proven to be the best house dogs I have ever had! I cant thank you enough for these two wonderful, sweet natured dogs! We wanted to share this photo with you. 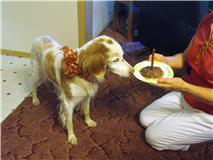 Today, July 26, 2010, our Brittany, Megan Ruff, turned 17 years old. We bought her from Rock Steady kennel in 1993. Her father was Criswalt Glen’s Nero and Mother Forest Valley’s Bridgette. She has been the most wonderful pet and companion anyone could ask for. 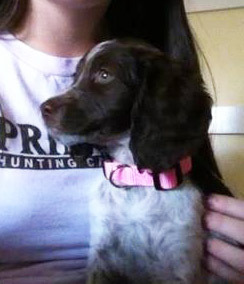 She no longer hunts, but up until last year she was a wonderful hunting dog. Now she is in retirement but still likes to go for walks in the woods. Her eyesight is failing along with her hearing but her spirit is still high. She gets along well with our grandchildren and other dogs. Doesn’t like cats too much however. She is a testimony as to the quality of dogs you breed. 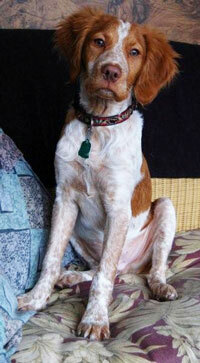 If we decide to get another Brittany in the future we will certainly give you a call. Sorry it took us so long to get back to you but the little guy has had us pretty busy! All is going great. 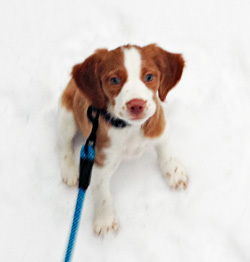 We decided on the name “Kenai” (pronounced “keen-eye”) after the river and region in Alaska. The trip home to CT went very well. He threw up once about 15 minutes into the ride and slept on my ( Fran’s) lap the rest of the way. We stopped once along the way so he could do his business, which he did and promptly went back to sleep. 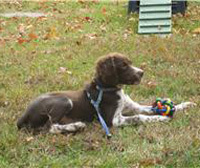 He is adapting very well to crate training and comes when we call as you trained him. We are giving him plenty of exercise on walks in the woods and he is enjoying exploring his new territory. He is getting used to our other Brittany as well as our 3 cats with no problem. He has a great disposition and is fitting in very well to his new home. All your hard work on socializing him really shows! He is doing great in all ways. We couldn’t be happier and we are giving him a great home here. He is an absolute joy & we thank you so much for everything. We’ll send pictures soon.